The EcoHitch® invisi hitch for the 2011-2014 Chevy Volt is designed to be completely hidden behind the license plate so you don't have to see a crosstube underneath your vehicle and has as much brilliance in every detail as your Volt. Rated for 300 pounds tongue weight and 2,000 pounds towing weight, this Chevy Volt trailer hitch won’t make you leave anything behind on your next big journey. *If you’re going to be towing and need trailer wiring, click here! Ensure your wiring harness does not drag on the ground by visiting our Eclipse trailer wiring bracket. With the Chevrolet Volt you are getting a stunning design and incredible efficiency, so you want a hitch that won’t compromise on either of these features. 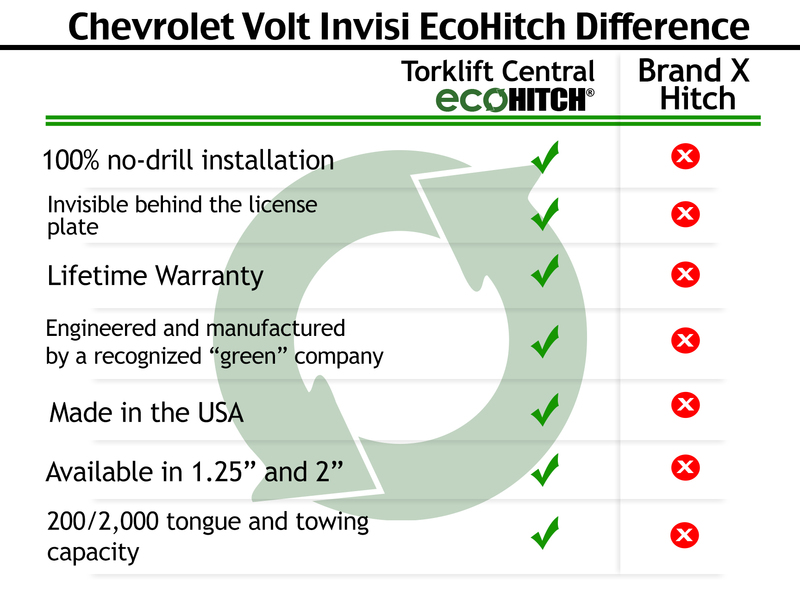 With the EcoHitch invisi hitch, you are getting a trailer hitch for Chevy Volt that has as many great design features as your Volt does including a completely concealed design and is made from recycled materials. With 300 pounds tongue weight and 2,000 pounds towing weight capacity the Chevy Volt EcoHitch® Invisi has the strength to bring along any items that you need on your next big adventure. We’ve created a perfect hitch for the Volt that gives you the freedom to maintain its fuel-efficient drive and still have great style and performance. The Invisi hitch for the Volt comes in both 1¼” and 2” receiver sizes so you get your choice of which bike racks and cargo trays that will work best for the receiver you choose. Our Invisi hitch is installed behind the license plate – making it so the hitch is always hidden behind the plate unless it’s being used. Instead of having a receiver hang below the bottom of your car, it gives you the most clearance possible by being located behind the license plate. The Torklift Central Invisi hitch is 100% completely hidden behind your license plate or factory knockout and comes complete with a license plate flip kit. No drilling to the frame is required; the hitch utilizes a bolt-on application. This hitch has the highest level of ground clearance out of all the EcoHitch® models available.